In the late 1700’s and early 1800’s, thousands of flatboats were floated on one-way trips down the Ohio River taking pioneer families west to settle the states of Kentucky, Ohio, Indiana, and Illinois. The deckhouse amid ships protected the furniture of the families aboard. People lived aboard, cooking on the bow and hauling farm animals on the stern. To maneuver the vessel around bends and away from the riverbanks, all hands manned the giant oars called “sweeps”. 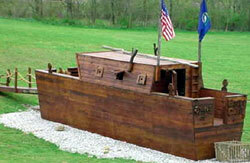 Upon arrival at their new homes, the settlers had many options of what to do with their flatboat. Use boat for a home. Take the boat apart to build a house. Burn the wood for heat. Sell the boat to others who wished to move farther. Sell the boat to farmers who shipped abundant crops to the Mississippi River onto the seaport of New Orleans for transfer to sailing ships destined for markets around the world. Farmer Jacob Yoder on the Monongahela River in western Pennsylvania built the first flatboats in 1782. Even after steamboats came on the scene on inland rivers in 1811, river men continued using flatboats because of their low cost. There were a variety of specialized flatboats to ship cargo to the world markets. Some flatboats were built with raked bows to be used on return trips alongside steamboats, serving as fuel flats, first hauling wood, than coal. These flatboats with raked bows evolved into coal boats. Coal boats were tied together in fleets to be pushed by steamboats. Those coal boats evolved into the enormous steel barges of today. The efficient use of the interconnecting rivers of mid-America in the past and today is part of the reason why Americans enjoy a high quality of life.